• Every year, Arles offers a magical and slightly different Christmas for everyone, Drôles de Noëls, a convivial moment in the middle of winter. Stroll, drift and enjoy the magic of the street events and activities. • Discover the world of the "santons" : at the end of the year the international santonnier fair offers exhibitions of santons and crèches in the Cloister StTrophime, inviting a different country every year. • Arles also has its own Carnival. Every spring the Drôle de Carnaval is held inArles over one day and offers street events and parades. 24 march 2019. • The Hortus garden, or the Roman-inspired garden, offers a circuit whichalternates games areas based on ancient models, thematic discoveryareas and relaxation zones. Visitors can play according to Roman rulesand compare each others strategy and skills in chess, ball games,hopscotch or jacks. • MP3 audio guides : with technology, exploring architectural heritagetakes a on a whole new dimension. Rent an MP3 player at the touristoffice to discover the town in an original and relevant way, throughthe sound extracts and accounts of famous people from Arles! Give your family holiday the taste of adventure by choosing an outdoor activity! The Marshes of Vigueirat on horse-drawn cart : well seated inside a large carriage, all thefamily sets off to see the Camargue fauna and flora. The mostecological and attractive means to see nature close up. 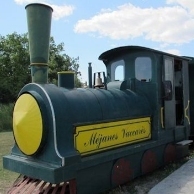 Le sentier des cabanes : this fun and informative circuit, located in themiddle of the Marshes of Vigueirat, in the Camargue, is particularlyadapted to children of 6 to 12. 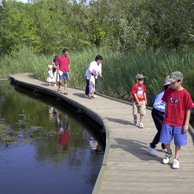 It offers them the pleasure ofunderstanding nature, observing, touching, tasting, handlingand learning, all while having fun! Horse-ride : horses give access to all terrains and theopportunity to see other species close up. A ride through the Camarguefor beginners and experts alike. Canoë :embark on a family canoeing adventure along the SmallRhône. This silent and fun boat will enable you to approach theCamargue from a new angle, from the river and to reach undreamed of places.